When I was at school I read I Am David and it is a book that has stayed with me for years. I bought a copy as an adult and read it again - to me, it was just as moving despite my extra years. Perhaps even because of them. I have a feeling that The Auschwitz Violin will have a similar impact on the current generation. This is an incredibly moving tale of a violin maker - or luthier - who is interred in a Nazi camp during World War II. Although he tells the officials he is a carpenter by profession, a chance encounter leads to his real profession of luthier being revealed. I don't want to give too much about the story away - there is a real beauty in how it unfolds - but his talent brings him to the attention of some of the higher camp officials and a cruel bet means he needs to draw on everything he has learned in order to save his own life. 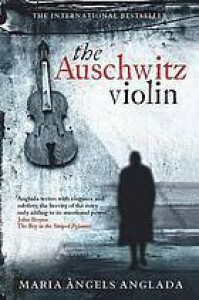 The Auschwitz Violin is beautifully told from the point of view of a quiet, hard-working prisoner. Daniel shows a quiet strength - he is unwilling to be broken by the cruelty of the camp's guards or the barbarity of the rituals but he is also wise and knows when to speak and when to stay silent. This is a short book - a mere short episode in the life of Daniel - and is almost a snapshot of a barbaric and heartbreaking time; however, it is no less poignant for that. I thought this was an immensely touching read and I felt a real lump in my throat as I reach the book's conclusion. I know this - like I Am David - will stay with me for many years. This review was originally published on Book Bags and Cat Naps. I received a copy of this book in exchange for my fair and honest review. I did not receive any additional compensation and all views are my own.